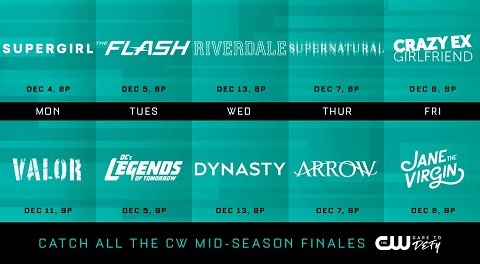 The CW has released its midseason finale dates and the majority of the network’s lineup will be going into winter hiatus beginning the first week of December. The earliest sign off will be Supergirl on December 4th, with The Flash and Legends of Tomorrow following on December 5th. The Thurday and Friday lineups close out the first halves of their seasons on December 7th and 8th, respectively, while Valor will air without the Supergirl lead-in for its fall finale on December 11th. The Wednesday lineup of Riverdale and Dynasty, meanwhile, will close things out on December 13th. The network had already announced return dates for its schedule, which includes Valor on January 1st, where it will air without Supergirl for another two weeks; Crazy Ex-Girlfriend on January 5th, where it will air without Jane the Virgin for three weeks; Supergirl on January 15th; The Flash on January 16th; Riverdale and Dynasty on January 17th; Supernatural and Arrow on January 18th; and Jane the Virgin on January 26th. Additionally, the series premiere of Black Lightning will be debuting January 16th at 9:00 following The Flash, with Legends of Tomorrow assuming another time slot in 2018. 2018 premiere dates for Life Sentence, The 100, iZombie, and The Originals should be revealed in the coming weeks.